This week we got a call from a lovely lady in Rozelle who was moving out into a new residence. 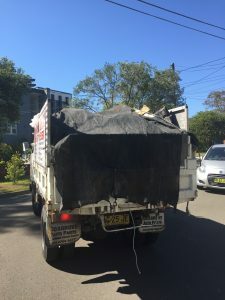 As a good tenant, she wanted to get rid of the remaining household rubbish before the final inspection by the real estate agent It was a good run over the Anzac Bridge and in 30 minutes after her call we were there to assist her. We loaded all of her rubbish including paint tins and all general household rubbish which required removal. The customer was happy and grateful that we could help on the day she needed it. Also that we were quick and on time. When moving home it is always good practice to leave the old home clean an tidy. Removing rubbish such as household items you no longer want or that work. Organising the removal of rubbish in advance is preferred if possible. But we at AAA Mr Rubbish Removal know that this can sometimes be difficult. That is why we offer our same day service. AAA MR Rubbish Removal always do our best to try to accomodate our customers. To try to releive some of the stress of moving. If you rent this is even more important as this action will provide you with good references for future tenancies. Remember good tenants attract good landlords and agents. With good references you will be on top of the list for preferred tenants. Rozelle is a suburb in the inner west of Sydney, in the state of New South Wales, Australia. It is located 4 kilometres west of Sydney's CBD and is popular with professionals and families. Approximately 43% of residents in Rozelle rent their homes. Due to it's proximity to the CBD the median rent for the suburb is $825 a week and to but the median is $1570000. Rozelle has a designated dog park, recreational parks and walking tracks.